Every August, hundreds of thousands of people from all parts of the globe descend on New Bedford, Massachusetts, for one of the largest parties on earth - the celebration of the Feast of the Blessed Sacrament. 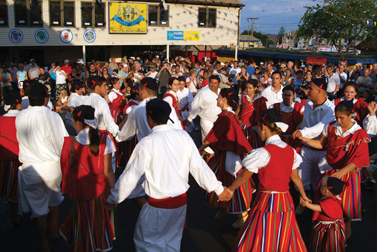 The festival is this weekend - July 30-August 2 - and marks the 95th such celebration of rich Portuguese tradition, culture, food, and music. 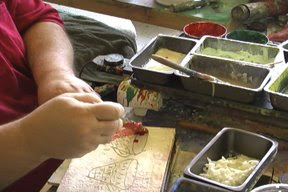 It's on as part of Rhode Island Stories - the exclusive WSBE program that presents stories about or by Rhode Islanders. At 7:30 PM, stay tuned for the The Home of Rumford Baking Powder: Past, Present, and Future. Archival photos and the reminiscences of former employees tell the history of the manufacturing source of the familiar staple in every cook's kitchen: a tall red tin of Rumford Baking Powder. 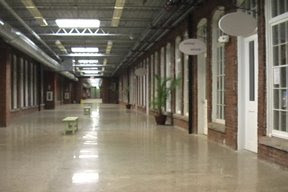 Once a manufacturing powerhouse that shaped Rumford Village, Rumford Center is now reshaping itself, through adaptive reuse as a community of apartments, offices, and shops. The digital conversion earlier this year was rocky for some, and no sweat for others. But how ever you weathered the revolution, all of your local television stations emerged with new channel choices for your enjoyment. WSBE Rhode Island PBS, for example, broadcasts on two over-the-air channels: its main schedule on 36.1 (formerly known as analog "36"), and WSBE Learn on 36.2. Of course, those channel numbers are only meaningful to you if you watch TV over-the-air, but it's a pure, basic starting point. Cable and satellite TV services have WSBE all over the place channel number-wise. More on that - and a clear Finder's Guide - in an upcoming blog! The prime time programming on WSBE Learn has evolved nicely since we first started broadcasting almost two years ago. (That's right, two years! But most of that was in obscurity until Cox finally picked up the channel in February.) As for the schedule itself, it's different from WSBE Rhode Island PBS - both in broadcast dates/times as well as content. Learn airs some series that are not broadcast on WSBE Rhode Island PBS: Austin City Limits, NewsHour, plus Tracks Ahead, Africa Trek, and From the Top at Carnegie Hall. Some main channel favorites are featured, of course, but on different days and at different times: American Experience, Scientific American Frontiers, P.O.V, Independent Lens, Great Performances, and a variety of How-To series from This Old House, to Everyday Edisons, to America's Test Kitchen, and more. Visit www.ripbs.org and click TV SCHEDULE (your second option from the left on the menu under the welcome banner) for the schedules for both channels! As always, your comments and questions are always welcome - post it here, or send an email to public @ the station Web site. Here's what's news with newsmakers and news analysts on the next installment of A Lively Experiment. 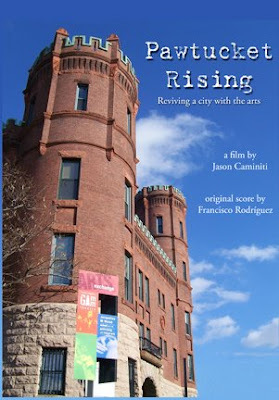 "PAWTUCKET RISING" July 11 at 7 P.M.
Like a phoenix rising from the ashes to live again, so is Pawtucket Rising. In fact, that's the name of the new documentary by local filmmaker Jason Caminiti about the historic city's renaissance. WSBE Rhode Island PBS will air the film on Saturday night, July 11 at 7 P.M. (and on Sunday, July 12 at 11 P.M.) on digital 36.1, Dish 7776, DirecTV 36, and on cable channel 8 in RI (Massachusetts cable subscribers should check their cable listings for the local channel number for WSBE). 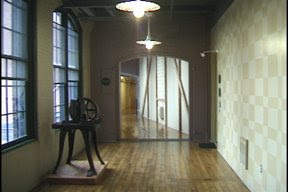 Pawtucket Rising is shown as part of Rhode Island Stories, a feature of WSBE Rhode Island PBS Saturday nights at 7 PM. Enjoy independent documentaries by and about Rhode Islanders! Picture it: Red Sox and Yankees. You and three friends. Cheering on the home team along the first base line at Fenway. Don't you just love it? From now through August 17th, when you make a $100 pledge to WSBE Rhode Island PBS, your name is entered into a drawing to win four tickets to the Boston Red Sox ~ New York Yankees game on Sunday, August 23rd. As an added bonus, your donation of $100 or more also enters your name into the drawing for tickets to a Red Sox game in September! Your odds of winning depend on the number of entries, of course. But the value of this ticket package far exceeds your donation. In fact, a quick check of StubHub.com just now shows the cheapest "Standing Room Only" ticket available for this Sox ~ Yankees game selling for $109.99 - that's for ONE ticket! WSBE Rhode Island PBS is offering FOUR field box seats, not SRO tickets. And now with two chances to win, it's a great time to give. Click here for more information.